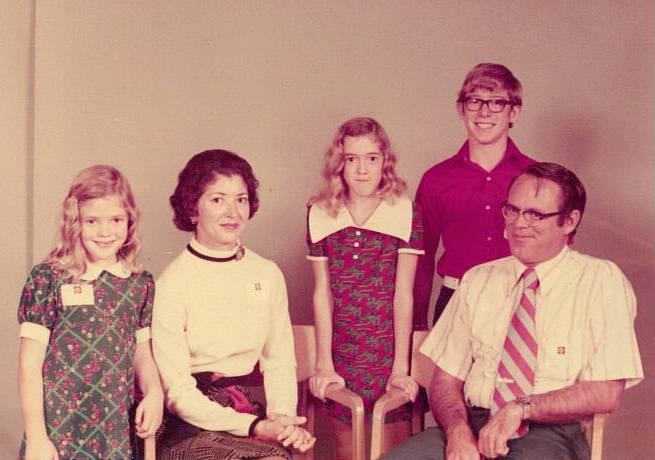 Mother’s Day circa 1969, my brother Tom and younger sister Laura and I get up and make breakfast for our Mom. It takes us at least 3 or 4 tries and subsequent tosses of undercooked and burnt pancakes into the trash. But finally we get the griddle just right and pull off a couple of edible ones. The tray is prepared with orange juice, her favorite strawberries and a small, clear vase filled with bright orange pomegranate flowers from the tree on our backyard patio. This year I had made a gift at school that I was especially proud of. I found the most perfect brown conch seashell and stuffed the opening with cotton and covered it in red velvet to make a tiny pin cushion. This was my favorite gift I had ever given my mom. Oh how proud the three of us were for our accomplishment. As a mother of two boys, I think back on what were my favorite presents. Without a doubt it was the special gifts and handmade cards they each made at school over the years. I still use the recipe box that Nick made in preschool with a picture of him clapping on the front of it. Hank handcrafted a colorful ceramic bowl that I treasure. Seeing their faces so proud is perhaps one of the greatest gifts of all. Over the years I have been asked often on what it takes to be a mother of a child with special needs. In many ways it is the same as for a typical child but it takes a greater amount of time, energy and perseverance. Milestones are not met and checked off the chart at the yearly physicals like a typical child. A large chunk of the schedule is carved out for working with your child at home and taking them to physical, occupational and speech therapy. 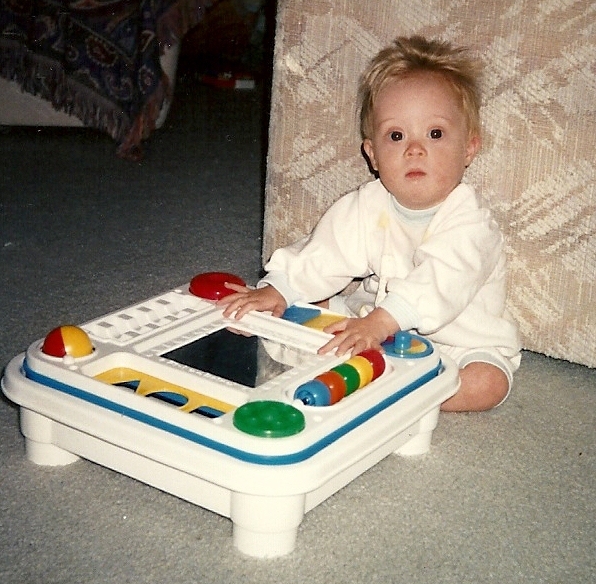 Having my son, Hank just 19 months older gave me a good idea of what the benchmarks were supposed to be. However, I realized quickly that Nick was going to do things in his own time. Nick’s time was much slower than a snail’s pace. Let me pause and offer the quick facts about Down syndrome. Wikipedia states that “Down syndrome also known as trisomy 21, is a chromosomal condition caused by the presence of all or part of an extra 21st chromosome It is named after John Langdon Down, the British physician who described the syndrome in 1866. The incidence of Down syndrome is estimated at 4.6 per 10,000 births. Often Down syndrome is associated with a delay in cognitive ability and physical growth, and a particular set of facial characteristics. 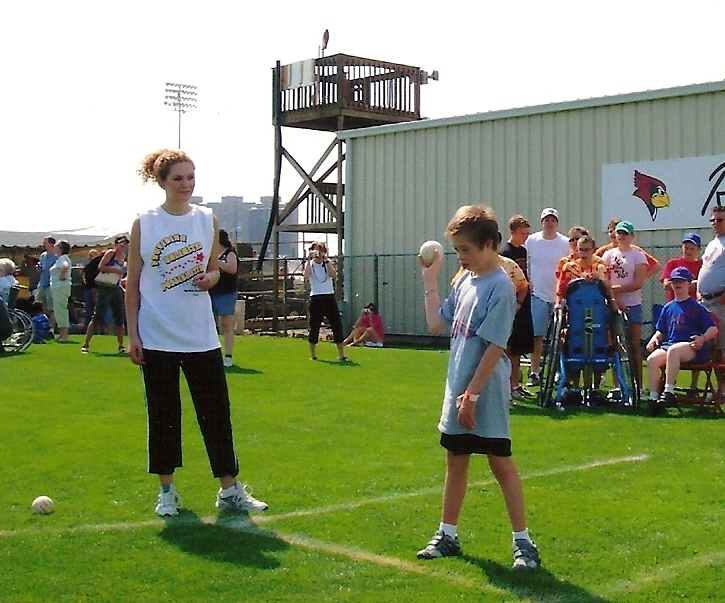 The average IQ of young adults with Down syndrome is around 50, compared to normal children with an IQ of 100. A large proportion of individuals with Down syndrome have a severe degree of intellectual disability. 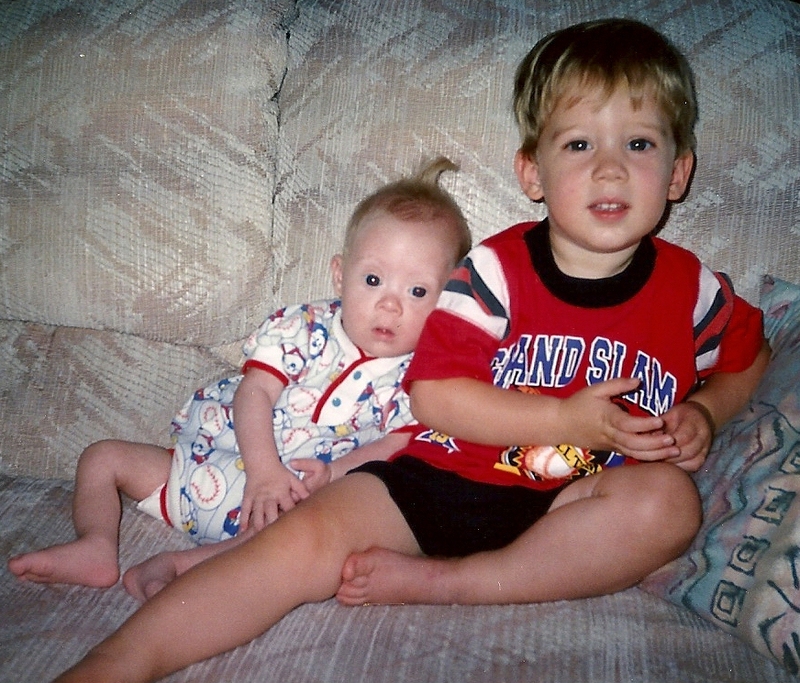 Nick with his brother Hank, with his low muscle tone we constantly had to prop him up for pictures. 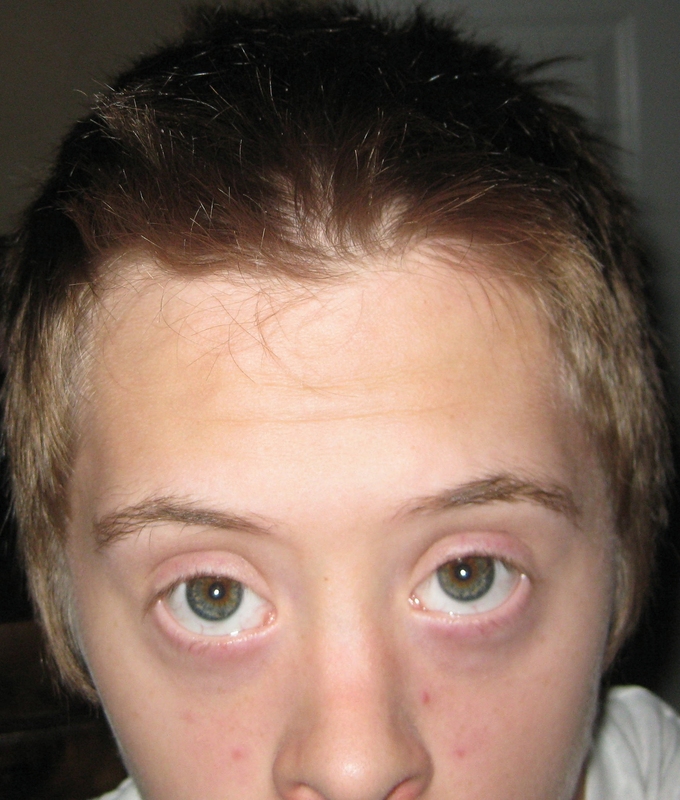 Individuals with Down syndrome may have some or all of the following physical characteristics: microgenia (an abnormally small chin)[ an unusually round face, macroglossi (protruding or oversized tongue), an almond shape to the eyes caused by an epicanthic fold of the eyelid, upslanting palpebral fissures (the separation between the upper and lower eyelids), shorter limbs, a single transverse palmar crease (a single instead of a double crease across one or both palms), poor muscle tone, and a larger than normal space between the big and second toes. Crawling- Average age= 14 months (range 9-19 months) / Nick= 24 months. Sitting while supported with own arms- average age= 8 months (range 5-15 months) / Nick= 12 months. Walking independently-Average=23 months (range 13-48 months) / Nick=40 months. 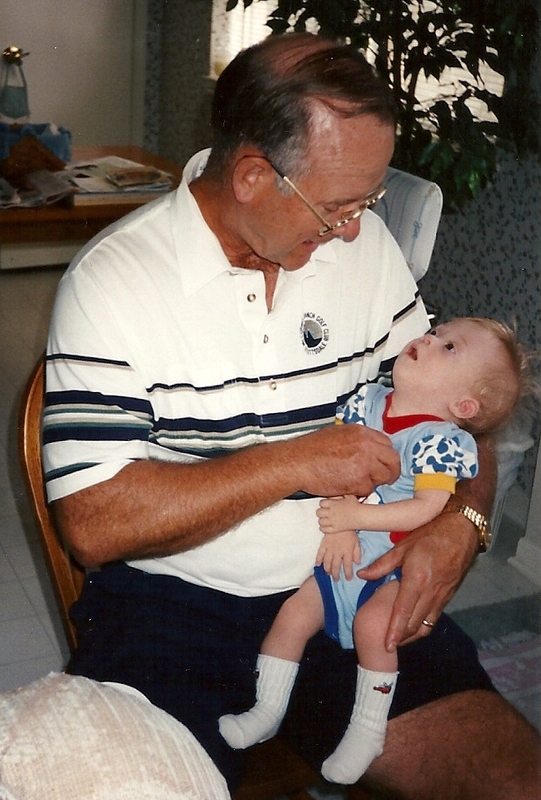 Nick at age 9 months with Grandpa Jim. He still looks like a rag doll…. While Nick developed much slower than the averages above, he did hit the marks and this proud mama can still taste the sweet victories of each glorious triumph! Yay, he is sitting up supporting himself with his arms at age 1! 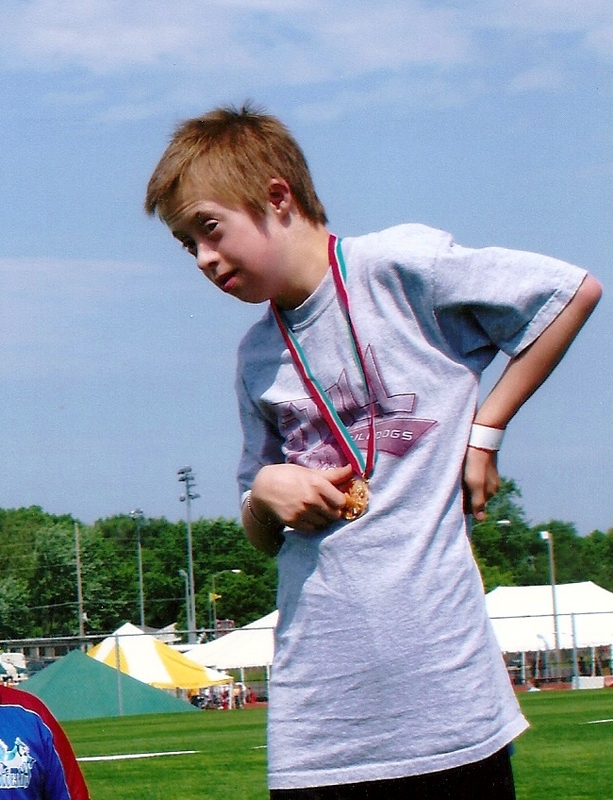 Who would have ever predicted that the low tone boy with wobbly legs that didn’t take off walking until 3 ½ years would run like a cheetah and win a silver medal at the Special Olympics in the 100 yard dash. And the year before, in fifth grade he became a state gold medalist in the softball throw down in Bloomington. Nick never got the significance of his medals. He was more excited about standing on the podium and dancing side to side as they played the Special Olympics music theme on a portable jam box. On the other hand, I was snapping photos like a crazed paparazzi photographer. 😉 He fought hard as we pushed him constantly for 12 years….. and look he won……Oh *Mama Mia! State Special Olympics Gold Medalist! Up on the top of the podium, taking a bow! That’s what is in my noggin this week. Until next week, may the milestones you strive for and meet be the sweetest of victories :). *Mamma mia (literally “my mother”) is an Italian interjection, used in situations denoting various kinds of emotions of surprise, fear, rejection, and joy. Great read, Teresa! 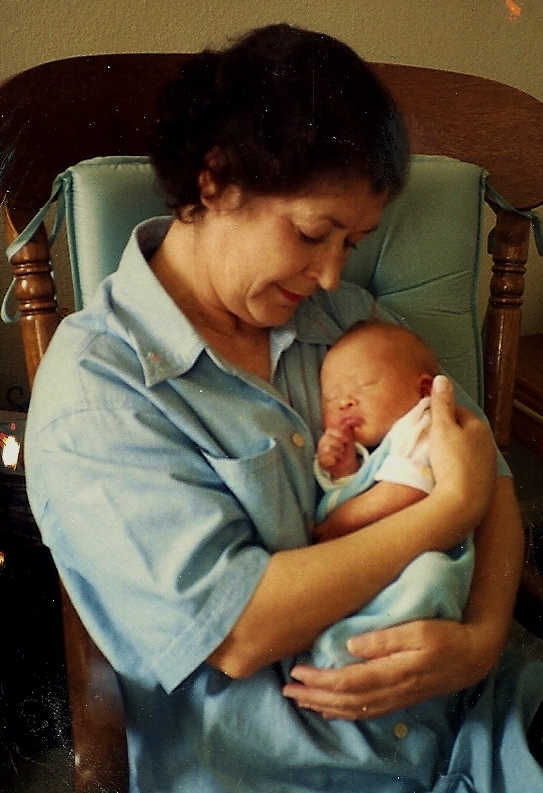 All the more reason why Mother’s Day is special….without you to love and guide him, become an expert in special needs and his tough unrelenting advocate in education, his development would not be where it is and that smile on his face. happy Mother’s Day! Great job by a great Mom! Happy Mother’s Day the day after! Thank you and right back atcha, have a great week!